1. One-way relay NO Touch-spot is for refrigerating output and NC Touch-spot is for heating output. 2. The current capacity of the output Touch-spot is 5A of restrictive load and 1A of inductive load. It can control the 1000W electrical heating or electrical motor or water pump of 200W. AC contactor is needed to enlarge the capacity for greater load. 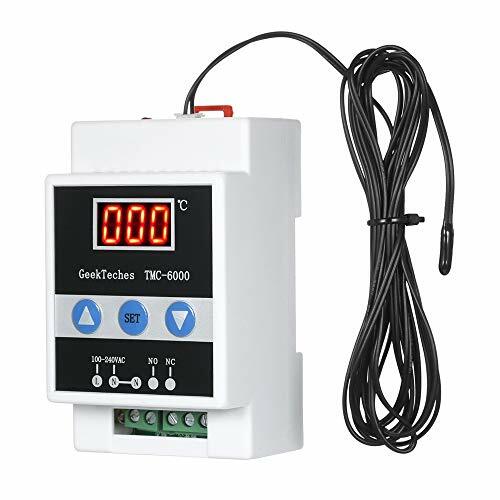 The one-way temperature controller can set as "refrigerating" or "heating", using 10K general NTC thermistor to control temperature, control the one-way relay (NO, NC) output. The temperature range controlled is -45 Celsius ~110 Celsius. It is widely used in various refrigerating and heating situations. Under refrigerating mode, the output opens when the temperature is above (temperature control value + return difference) and stops when temperature is at the temperature control value.Under heating mode, the output opens when the temperature is below (temperature control value - return difference) and stops when temperature is at the temperature control value. Adjustable temperature control value and return difference value with correction function for measured temperature deviation.Adopt DIN guide rail type installation, easy and fast to install.Adopt the advanced design of isolating power supply, ensuring the controller work steadily, reliably and continuously when the power supply changes between 100V~250V ADC. One-way 10K NTC temperature sensor input and one-way NO & NC output.Shifting between the refrigerating and heating modes with temperature display.Delay protection of compressor and power-down memory protection function.The temperature sensing line could be connected with general wire for 100 meters.Set the parameter to conserve long-term memory of power-down. NOTE: The max load current of this product is 10A, please ensure an allowance (around 6A) during long-term using to increase the using time. The parameters and set in the user manual are those when the load connects onto the NO end. If connection onto the NC end is required, please set accordingly.